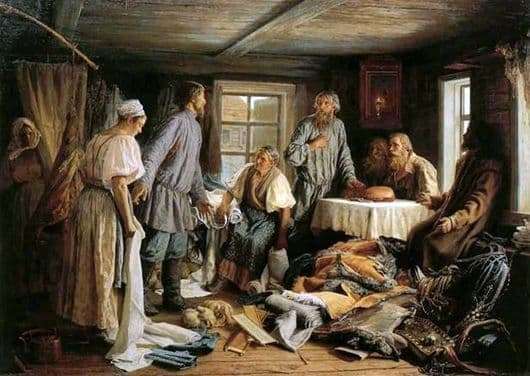 The painting “Family section” by the Russian artist-an advocate Vasily Maksimovic Maksimov, a native of a simple peasant family. The artist completely shared the ideas of the populists, and the image of the life of the people was the main theme of his works. In the picture he very vividly and realistically depicted the spirit of the then village, the split of the former patriarchal foundations. Here is the division of property between the two brothers. Immediately felt distemper. In a small cramped room, the whole family gathered for family council, a heap of clothes, fabrics, furs, and other utensils were scattered across the floor. Greed and self-interest against helplessness and modesty – the eternal theme of the struggle, which is most clearly shown in the female types. A girl who stands to us with a half-bow, her head bowed from sadness – the younger daughter-in-law, deceived and destitute. Her image is sad and poetic, as in the paintings of Venetsianov, she causes sympathy and sadness. The opposition to her is the greedy and wicked wife of an older brother. She sits on a chair with a view of her own superiority and looks at her daughter-in-law with a sarcastic reproach. But it is impossible in the full sense of the word to call a picture plausible. For peasant customs had their own order and charter. All this abuse and a dispute between two brothers, this whole section with a living father – absolutely implausible.